Snow shoes work by distributing the weight of the wearer over a greater surface area to avoid them sinking into the snow – therefore they’re an extremely popular and worthwhile investment. Traditional snow shoes resembled tennis rackets and did the job pretty well but over the years, companies have worked hard on creating more attractive designs that do the job even better. MSR is one such company and their snow shoes are extremely popular including amongst professionals who demand the very best from their accessories. Reliable, stylish and lightweight, their snow shoes are the result of many years of research and development. The MSR Lightning Ascent Snowshoes are now compatible with MSR’s modular flotation tails and reign supreme as the company’s most aggressive snow shoes. The crampons are great and most of the teeth sit on the outside of the frame which makes grip even easier. These MSR snowshoes are super comfortable and they fit easily over various types of boots. In snowy or icy conditions, these shoes can cope and keep you steady on your feet. Even when tracking on steep surfaces, these shoes will make you feel stable and comfortable. The televators that come as standard will save your skin on steep hills. They are bars that you can flick up on demand to support your heels if you’re encountering tricky inclines. They don’t buckle easily which helps this shoe beat the competitors on that front – even when they’re only flicked halfway up. Be sure to wear with fairly thick shoes as the material can dig into your feet if the material of the boot underneath is not thick enough. Be sure to always consider the weight of your gear as well as your personal weight when choosing the appropriate shoe for you. You might find that the binding knobs are a little difficult to use at first but this should ease after a few uses. The only other downside is that it can be tricky to turn quickly in these shoes but then find us a snow shoe that doesn’t have that problem! You can buy extra tails to add to the flotation of these shoes if you’re trekking through fine, powdery snow – though they’re not miracle workers and you may still sink in really fine snow. 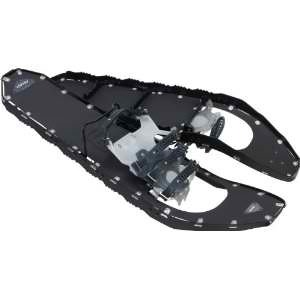 If you’ve tried out other snow shoes and not been satisfied, chances are your hunt will end with the MSR Snowshoes. They are a perfect length and are extremely well built. Reviews across the web will agree that these shoes are a great choice if you’re a snowshoeing fan. This entry was posted in Other, Reviews, Snowshoes, Spikes and Crampons and tagged MSR, Snow Shoes. Bookmark the permalink.